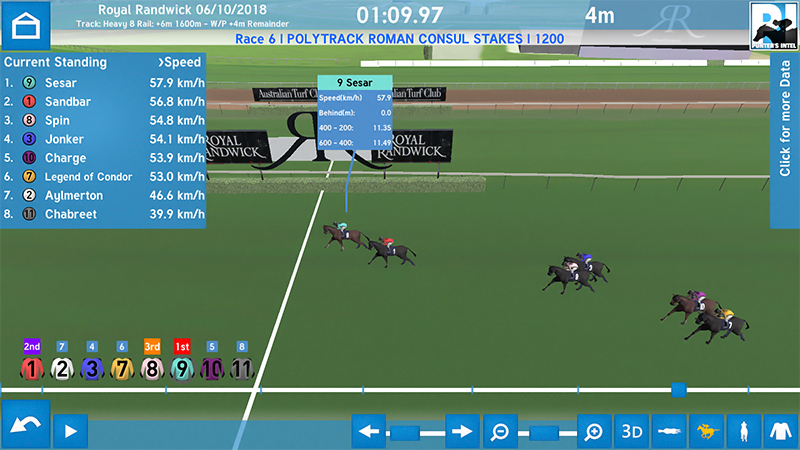 Sesar reigned supreme in Saturday’s Roman Consul Stakes at Randwick relishing a hot speed. The three-year-old ran his last 600m in 34.39s, which was a whopping 4.5L faster than the next best in the race. That next best was the ever brave Sandbar (35.13s). His run was full of merit given how close he was to the front-runners Chabreet and Aylmerton in the run. The leader Chabreet clocked 34.71s for his first 600m. That is humming on a Good track let alone a Heavy 8. That duo finished at the tail of the field, while Jonker, who also settled a pair back alongside Sandbar, labored into fourth, finishing 5L behind Sandbar. Sesar ran his last 200m in 11.55s, 2.5L superior to Sandbar’s 11.94s, and they were the only two to break 12s home. It was a day out for Queensland trainer Steven O’Dea with stablemate Doubt Defying also winning in dominant fashion, clocking 34.65s his last 600m. That 1400m race was won in a time roughly 7L quicker than the opening race on the card won by Yulong January. That was despite the lead times to the 600m being only 1.5L apart. Now, what does Punters Intel tell us about the run of Thinkin’ Big in the G1 Spring Champion Stakes? The race favourite had to work early to sit outside of Irukandji (who was beaten 27L in the end) and from there, never had the chance to back the tempo off. Thinkin’ Big felt the pinch the last 400m, as he was entitled to, with Maid Of Heaven reeling off a last 400m of 23.88s, which was 5.5L quicker than Thinkin’ Big's (24.75s). Stick with Thinkin’ Big. The sneaky run in the race was Dealmaker, having missed the Gloaming Stakes. His last 200m of 12.19s ranked third only behind the quinella, Maid Of Heaven and Aramayo. The way that 2000m race was run was in stark contrast to the event won by Cosmologist. The recent addition to the Joe Pride stable had it all his own way in front, running his first 1000m over 20L slower than Thinkin’ Big. Raqeeq’s effort to get as close as he did at the finish was full of merit, clocking 34.79s for his last 600m, despite his prior form suggesting he is better on top of the ground. Abdon put the writing on the wall to suggest another win isn’t far away, running second to stablemate Zourkhan. Missing the start proved costly. It’s no surprise that his last 200m was the fastest in the race (12s flat). Look out for him next time if he finds another wet track. Punters who backed I Am Serious into the odds on quote in the G3 Angst Stakes should be singing the praises of James McDonald. His neat ride proved the difference with Punters Intel revealing she ran home her last 600m in 34.94s, compared to Dixie Blossom’s 34.93s. However, I Am Serious covered 1608m in the run compared to Dixie Blossom’s 1610.6m. It was Princess Posh that hit the line hardest though, clocking 34.79s the last 600m from the tail of the field. Last but not least was the effort of Warranty. Man Of Peace crawled along in front before scooting home his final 600m in 34.41s. That made it impossible for anything to chase him down. Warranty clocked a slick 33.70s for her last 600m to run second.